Congratulations, you’ve gotten engaged, what now? The last few weeks I’ve been working with a couple looking for their ideal wedding venue but totally unsure where to start. I thought it would be a good time to write something about how to choose the right venue for your wedding. You know you want your special day but how do you choose where? So many things are optional for a wedding: should we have a cake or dessert bar; a DJ or a band; a photographer or a photobooth? One thing every wedding needs is a venue! So how do you find the right venue for you? In the UK we are extremely lucky to have such a wide and varied amount of venues to choose from. You could say your vows in a traditional church. Perhaps you’d prefer something more individual like the beach with the waves washing over your feet! Whatever you’re looking for, traditional or unique, there is plenty to choose from. Here are some top tips to finding the right venue for your wedding. First things first, talk to a wedding planner! Of course you’d expect me to say that, but a planner can actually really help you here. They can find the venue for you, even identifying some of those lesser known gems you wouldn’t find by yourselves. Searching on your behalf they’re saving you time: the hassle of trawling all the directory sites yourself; and sometimes money as they can negotiate discounts on your behalf. Even if you’re not sure about a planner, the next thing you need to think about is budget. You should decide how much you can afford to allocate to your wedding as a whole. If you’d like some pointers on how to figure that out, take a look at our ‘How much does a wedding cost’ blog. Once you know what your overall budget is and how it breaks down, you will know how much you can afford to spend on your venue. Typically though, you should be able to allocate around a quarter of your budget to your venue hire. What sort of wedding do you want? Do you see yourself in a stately home or a fairytale castle? Perhaps you have visions of a festival style wedding with firepits and tipis? There are so many options to choose from. If you’ve dreamt of this day your whole life you may already know exactly what you want, equally you may have no idea where to start. Both are fine! The key thing needs to be that you reach a decision together. Choosing a theme may help to dictate the style of venue you’re going to be looking for e.g. if you want a rustic, natural, woodland theme, it would probably look out of place at a contemporary, industrial building. Your theme needn’t be overly obvious, it could just actually be a certain feel, for example a cosy, winter wedding. However, the theme of your wedding and the venue should complement and ultimately create each other. If you’re looking for glamour and luxury, perhaps consider the boutique hotels near you. 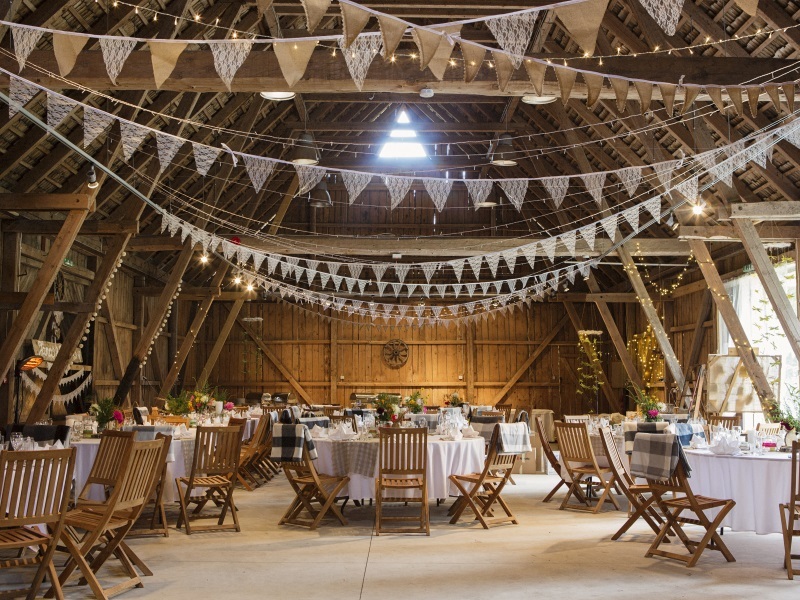 A rustic or vintage theme lends itself to a barn. If you’re undecided, perhaps a marquee in a family garden which would enable you to have either. Or if you haven’t got a big back garden to use, a village hall can offer space, a blank canvas and be much lighter on the wallet. So, you decided how much you can spend, the style you’d like. The next big factor is how many people you’ll be inviting. If you’ve always dreamt of having everyone you know there to watch you on your big day this will definitely affect the size (and cost) of venue required. There is no point booking a venue that will only seat 50 guests if you plan on inviting 100! On the other hand, if a more intimate affair suits you both better, you may be able to spend more on your venue as your costs per head will be less. In the words of Phil and Kirsty, location, location, location! You need to consider how you (and your guests) will get to your wedding. When your ceremony and reception venue are in different locations ensure it’s easy for everyone to get from one place to another. Will you need to book a hotel the night before the wedding? Are there hotels close by, will there be enough accommodation options for your guests? The things to think about can feel endless, so below is a checklist of questions to consider as a couple to help you decide on the type of wedding and reception you want and what you need from your venue/s. Do you want the venue to be exclusively yours for the day e.g. in a hotel there may be other guests who are not part of your wedding wandering around. In a church – is there a particular church that holds sentimental significance for you? At your reception venue – would you like the whole day to be in one location? A non-religious ceremony – a handfasting or blessing instead of, or as well as a legally recognised ceremony? Do you want to get married at a particular time of year? Do you want to be indoors/outdoors or a mixture of the two? Do you want somewhere at your venue to take all your bridal portrait shots? Are you dreaming of a traditional hotel/stately home or a less formal tipi/marquee affair? Would you like to provide a wedding breakfast for your guests and an evening option? Do you want live music or a DJ? Do you want staff to be available on site or are you happy to hire them in? Do you want the venue to provide a bar or would you like to bring able to bring your own alcohol? What time do you expect the party to end? Typically venues will close the bar around 11pm, with everyone gone by 11:30/12, but some are open until 1am. Many couples choose to book their favourite venue 12-18 months in advance, sometimes even 2 years. Being prepared can ensure your venue is secure and you have plenty of time to plan. Popular venues book up quickly during peak wedding season (June-September). If you have your heart set on somewhere, always contact them as soon as you’ve decided, to see what availability they have. That’s not to say you can’t plan a wedding in just a few months, or even weeks, but you may have to compromise on your venue if its already booked up. Some venues offer last minute deals from cancellations or if they have been unable to fill the date though, so it is always worth contacting them if you are planning your day on a shorter timescale. What do you do if you disagree?! Planning your wedding can be a good preparation for marriage itself. Being married is about working together as a team, sometimes meaning a compromise for one, or both of you. Importantly, you need to both realise what matters most to each other and how you can both achieve your visions for your special day. Ultimately don’t forget, a wedding is about the two of marrying each other, it’s not just about how good the after party can be! Finding a venue can be tricky, time consuming, stressful and overwhelming. Why not contact Wild Wedding Company to see how we can help with your planning, coordination and decor.